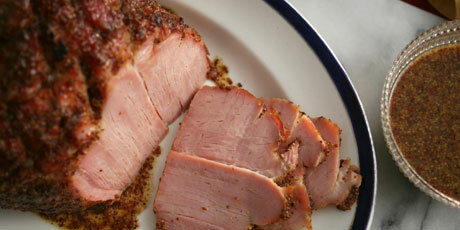 You might also like these Ham Recipes to Serve This Easter. 1. For glaze, bring wine and shallots to a simmer in a small saucepot and reduce to ¼ cup. Remove pot from heat and stir in honey and mustard. 2. Preheat oven to 275°F. Place ham in a roasting pan and score the skin on top. Place in oven and bake, uncovered, for 7 hours. Spoon half of glaze over ham and baste, cooking for 1 ½ hours more. 3. Carve ham and serve with remaining glaze.